Edit:" please see the attached figure. The blue part is all I have. Also, you can neglect the noise term. Assume the signal is deterministic. Typical values of the unknown parameters $\alpha$ and $\omega_0$ are in the the range [0.25,5]. Note that all the parameters are unknown $A \omega_0, \alpha, \phi_0$. The setup hints at curve fitting which I did but don't prefer." with very low start frequency $\omega_0$ and chirp rate $\alpha$. The signal is sampled at high sampling frequency $f_s$. But the available time domain signal is short, i.e. barely a complete cycle. 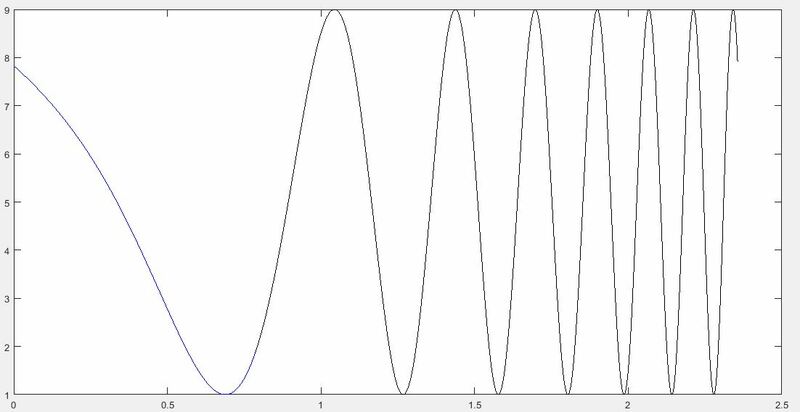 The amplitude of the signal and the phase shift are also unknown. Are there ways to figure out the chirp parameters other than curve fitting or spectrogram? Amplitude $A$ is trivial. Square and low-pass filter/average; then take the square root. From the resulting linear function, $\alpha$ can directly be extracted as the slope, and knowing the slope, $\omega_0$ is just the constant summand. With $A$, $\omega_0$ and $\alpha$ known, you can simply compare at any fixed $t$ to find $\phi_0$. Not the answer you're looking for? Browse other questions tagged fft chirp or ask your own question. How can the FFT be used for estimating linear chirp parameters?